You may have heard that a massive series of automotive recalls are underway to replace air bags made by big auto-industry supplier Takata. The U.S. Department of Transportation says that the number of cars that need to be recalled has grown to almost 34 million. But the investigation is continuing, and that number could grow further. The recalls have expanded to include cars from nearly all of the major automakers. Many owners of affected cars haven't yet received recall notices, because the automakers have been scrambling to identify all of the affected cars and notify owners. But many consumers have already received recall notices, or heard reports about defective "exploding" air bags and wondered how to find out if they're affected. How big a deal is this, and what should car owners do? The short answer is that the risks are statistically quite low -- but they're still serious. Air bags are wonderful safety devices that have saved many lives: The U.S. Department of Transportation estimates that frontal air bags saved over 25,000 lives between 1987 and 2008, and likely many more since. But to do their jobs, air bags need to deploy instantly and explosively in a crash. "Explosively" is accurate: Air bags use a propellant similar to gunpowder to deploy quickly. The issue with the defective Takata air bags is that the propellent can deteriorate over time under certain conditions. That has resulted in some cases in which the airbag's metal housing has ruptured. If the housing ruptures in a crash, metal shards can be sprayed throughout the inside of the car. For anyone in a car when that happens, that's a potential disaster. 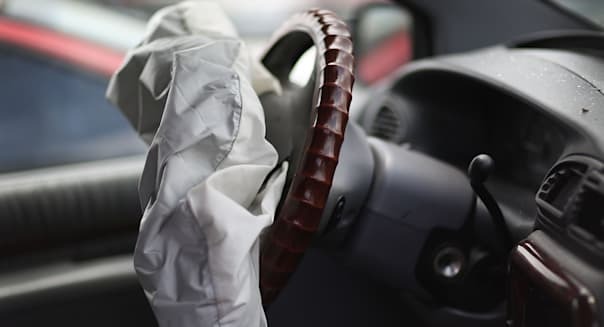 Over 100 injuries, including six fatalities, have been linked to the defective Takata air bags. That's a tiny percentage of the tens of millions of cars on the roads that have Takata air bags. But the danger is still very real. The National Highway Traffic Safety Administration, part of the U.S. Department of Transportation, has a new website devoted to updates on auto recalls, including the airbag recalls. You can find it here at NHTSA's Recalls Spotlight website. That site includes a tool that allows you to enter your car's Vehicle Identification Number, or VIN, and search to see if there are any active safety recalls affecting your car. If your car isn't listed, keep checking back. Not all of the affected cars have been added to the database yet, because some of the recall orders are very recent and the automakers are still working to gather the VINs of the affected cars. But all of the automakers are working hard to notify owners and replace the affected air bags. The risks appear to be highest in cars that have spent much of their lives in warm, humid areas, according to NHTSA. The automakers are prioritizing repairs for cars in places including Florida, Georgia, Hawaii, South Carolina, the Gulf Coast states and U.S. island territories. But it could take a year or more for the automakers to complete the needed repairs -- meaning that some consumers may have to wait months before their defective air bags can be replaced. The problem is a shortage of replacement air bags. To be very clear, this isn't the automakers' fault. The blame for the defects falls squarely on Takata, which may have known about -- and concealed -- the defects for years. But the sheer numbers involved have overwhelmed Takata's ability to make replacement air bags. Takata has scrambled to boost its production, but even with its expanded output, it can only make about 450,000 units a month, according to an Automotive News report. At that rate, it will take several years to supply enough new air bags to fix all of the affected cars. Another giant airbag supplier has stepped up to help. Industry leader Autoliv (ALV) said in January that it has committed to deliver up to 25 million additional airbag inflators to its automaker clients, and that it is expanding its production capacity as quickly as possible in order to meet those commitments. But it will still take months to install new assembly lines, and many of those airbag inflators won't be delivered until 2016. That could leave affected consumers hanging for a long time. If the dealer says that it's waiting for parts, ask to be put on a waiting list so that the dealer will call you when it receives the replacement airbag parts. The risks to any individual driver or passenger are very low. But the consequences of this defect can be serious. Don't hesitate to drive and enjoy your car, but do get this taken care of as soon as possible. Motley Fool contributor John Rosevear has no position in any stocks mentioned. The Motley Fool recommends Autoliv. Try any of our Foolish newsletter services free for 30 days. Check out our free report on one great stock to buy for 2015 and beyond.